Well, now. I got a birthday present when I came home from the recent travels that did my old heart good. Make that “gud.” It came from a friend in Colorado who reads the blog and who is herself a darn “gud wrtr,” too. It arrived in a Land’s End bag that I was pretty sure I hadn’t ordered. But my heart leapt a bit when I saw it because I am a big Land’s End fan. Wear their swimsuits all the time. When I opened the bag and pulled out a big towel, I was surprised but even more so when I unfolded it. I am grateful to Connie Raub, who had the great idea to get me a ginormous beach towel with the blog name on it. She is a woman I admire for many reasons, not the least of which is that she spent 30 years teaching music and history at junior high and high schools in Southern California. Rounding up and whipping into shape kids in high school. Junior high. Coaching them through school musicals and performances. Teaching social studies and world history, European history, U.S. history. In high school. In 1997, she and her late husband Richard (a crackerjack community college choir director) retired to Colorado Springs. 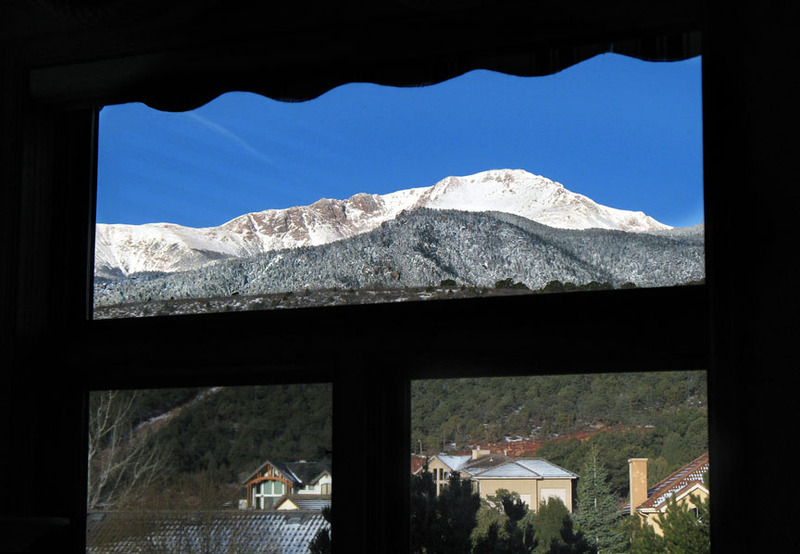 Pike's Peak from Connie's living room. Though she has some of the prettiest hands and most perfect nails I have ever seen, she dons heavy gloves and wields a mattock, a pickax-like thing used for digging and chopping, helping to maintain Richard’s trails. And she’s taking hula lessons, too. She is my hero. 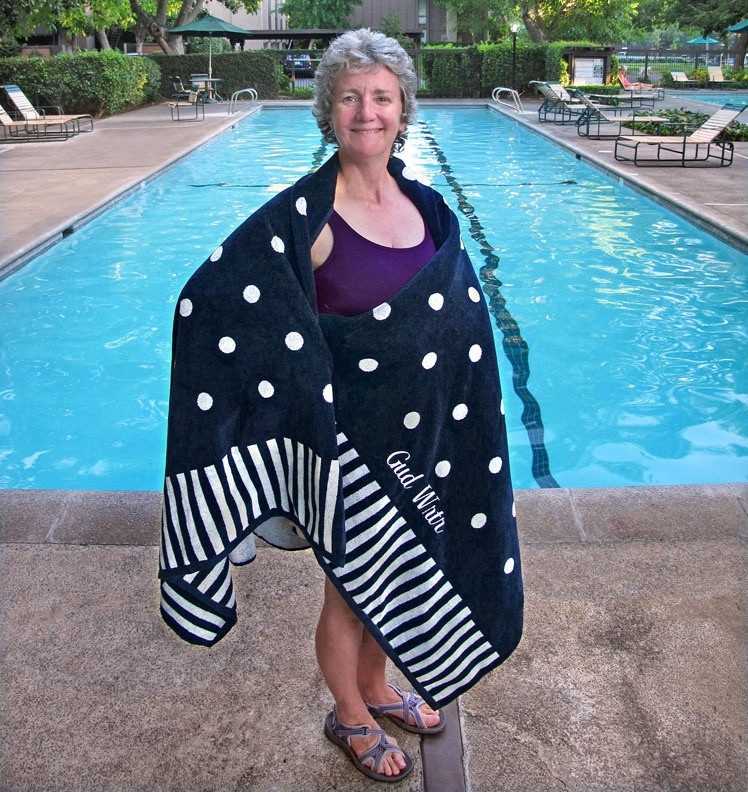 Not just for the towel but for all she does and the enthusiasm and good cheer with which she goes through life. I aspire to that kind of retirement one day—full of pursuits that enrich not only me but others, too. And now, my BF, who came up with the GUD WRTR concept, can say that she has been published on a license plate and a towel. Hand crafted trails! That’s impressive. 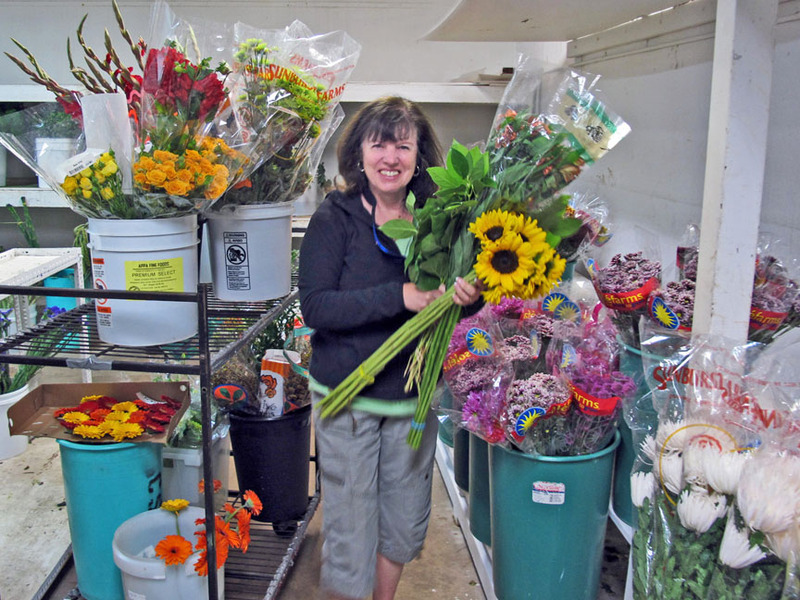 Lovely pics, Connie looks like someone you’d like to have over for dinner – my highest praise. You are looking Mahvelous! Beach towel or no! Very clever, Connie. Great present. Connie! You are the Gud Wrtr, too! I love the towel and am moved by your words… really, really gud wrtng there. Mahalo nui to yui! Ah! A perfect gift, and you wear it well. YOU ARE READY FOR THE RUNWAY! BRILLIANT!